When does DNA behave like sand or toothpaste? When the genetic material is so densely packed within a virus, it can behave like grains of sand or toothpaste in a tube. That’s essentially what biophysicists at UC San Diego discovered when they began closely examining the physical properties of DNA jammed inside viruses. “We found that under certain conditions, DNA behaves like toothpaste or sand, or like LEGO pieces when you try to put them back into the box and they don’t seem to all fit,” said Douglas Smith, a professor of physics at UC San Diego who headed a team that published its unusual discovery this week in the journal Nature Physics. “Strands of DNA not only contain genetic information, but can behave like ‘granular’ materials composed of randomly arranged particles (in this case, segments of the DNA string) that undergo what physicists call ‘jamming’ and ‘unjamming’ transitions, resulting in either solid-like or fluid-like behavior,” he explained. “Sand pours out of a cup like a fluid, but comes to rest in a solid pile on the ground where the sand grains are jammed together. Toothpaste doesn’t flow out of the tube until you squeeze it because it is contains tightly packed particles that are jammed but un-jam when you apply force so that the toothpaste can flow out. 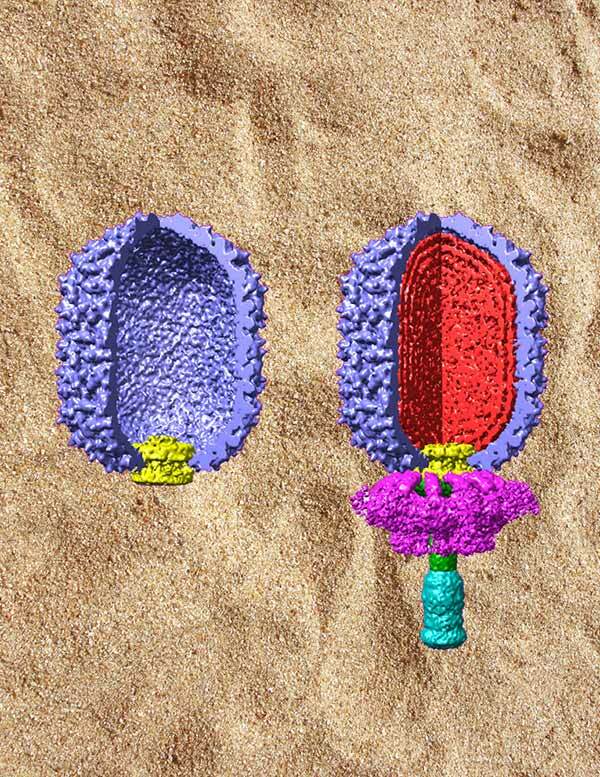 Many viruses use a tiny “nanomotor” to pack DNA into their viral shells. But during this process, strands of DNA sometimes become jammed and the motor is unable to complete its job. To better understand this process, Smith’s team of researchers, which included molecular virologists at the University of Minnesota, cleverly applied the research of other physicists who characterized the processes of jamming (and un-jamming) a diverse set of materials consisting of randomly arranged particles—such as sand, pastes, foams and emulsions—to determine exactly what was happening to the viral DNA on a nanometer scale. The researchers found to their surprise that DNA segments frequently become jammed within the virus when they are “sticky,” or more attractive, a condition that physicists had previously predicted would make it easier to pack the DNA. DNA packaging is an essential step in the life cycles of many kinds of viruses, including adenoviruses, pox viruses and herpes viruses that infect humans. So could this discovery be used to inhibit DNA packaging and keep dangerous viruses from replicating and infecting us? Possibly. The scientists found that addition of polyamines—small, positively charged molecules—causes viral DNA to become jammed and halt its packaging process.